The cube at the site for future monument for victims of the Soviet famine (1931–1933) in the center of Almaty, Kazakhstan. Caused by Sovietization under Filipp Goloshchekin causing Kazakhs to call the famine: "The Goloshchekin genocide"
The major ethnic groups in Kazakhstan 1897–1970. 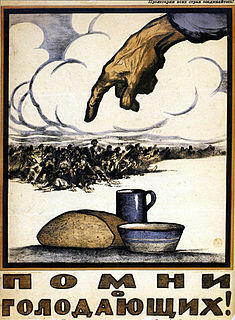 The number of Kazakhs and Ukrainians decreased in 1932–1933 due to famine. The Kazakh famine of 1930–1933, known in Kazakhstan as the Goloshchekin genocide (Kazakh: Goloshekındik genotsıd), also known as the Kazakh catastrophe, was a man-made famine where 1.5 million (possibly as many as 2.0–2.3 million) people died in Soviet Kazakhstan, of whom 1.3 million were ethnic Kazakhs; 38% of all Kazakhs died, the highest percentage of any ethnic group killed in the Soviet famines of the early 1930s. 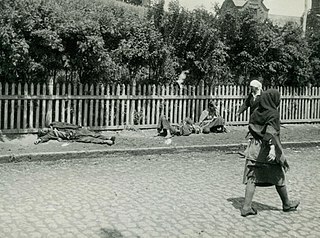 It was the most severe of all regions affected by famine, percentage-wise, though more people died in the Ukrainian Holodomor, which began a year later. In addition to the Kazakh famine of 1919–1922, in 10–15 years Kazakhstan lost more than half of its population due to the actions of the Soviet power. Some historians assume that 42% of the entire Kazakh population died in the famine. The two Soviet censuses show that the number of the Kazakhs in Kazakhstan dropped from 3,637,612 in 1926 to 2,181,520 in 1937. The famine made Kazakhs a minority in the Kazakh ASSR, and not until the 1990s did Kazakhs become the largest group in Kazakhstan again. Before the famine, around 60% of the republic's population were Kazakhs, but after the famine, only around 38% of the population were Kazakhs. A monument has been constructed in 2017. Some historians and scholars consider that this famine amounted to genocide of the Kazakhs. ^ "The Kazakh Famine of the 1930s". ^ a b Volkava, Elena (2012-03-26). "The Kazakh Famine of 1930–33 and the Politics of History in the Post-Soviet Space". Wilson Center. Retrieved 2015-07-09. ^ a b http://world.lib.ru/p/professor_l_k/070102_koval_drujba.shtml - "Запомнил и долю казахов в пределах своей республики - 28%. А за тридцать лет до того они составляли у себя дома уверенное большинство"
^ a b PIANCIOLA, NICCOLÒ (1 January 2001). "The Collectivization Famine in Kazakhstan, 1931–1933". Harvard Ukrainian Studies. 25 (3/4): 237–251. doi:10.2307/41036834 (inactive 2018-09-04). JSTOR 41036834. ^ Pannier, Bruce (2007-12-28). "Kazakhstan: The Forgotten Famine". Rferl.org. Retrieved 2015-07-09. ^ "Во время голода в Казахстане погибло 40 процентов населения". ^ Snyder, Timothy (2012). Bloodlands: Europe Between Hitler and Stalin. Hachette UK. p. 90. ISBN 9780465032976. ^ John Arch Getty, Roberta Thompson Manning, ed. (1993). Stalinist Terror: New Perspectives. Cambridge University Press. p. 265. ISBN 9780521446709. ^ European Society for Central Asian Studies (2004). Gabriele Rasuly-Paleczek, Julia Katschnig, ed. Central Asia on Display: Proceedings of the VIIth Conference of the European Society for Central Asian Studies. LIT Verlag Münster. p. 236. ISBN 9783825883096. ^ Sabol, Steven (2017). "The Touch of Civilization": Comparing American and Russian Internal Colonization. University Press of Colorado. p. 47. ISBN 9781607325505. Conquest, Robert, The Harvest of Sorrow: Soviet Collectivization and the Terror-famine (Edmonton: The University of Alberta Press in Association with the Canadian Institute of Ukrainian Studies, 1986). Kindler, Robert, Stalin's Nomads. Power and Famine in Kazakhstan, Pittsburgh: Pittsburgh University Press, 2018. Sahni, Kalpana. Crucifying the Orient: Russian orientalism and the colonization of Caucasus and Central Asia. Bangkok: White Orchid Press, 1997. The demographics of Kazakhstan enumerate the demographic features of the population of Kazakhstan, including population growth, population density, ethnicity, education level, health, economic status, religious affiliations, and other aspects of the population. Some use the word Kazakh to refer to the Kazakh ethnic group and language and Kazakhstani to refer to Kazakhstan and its citizens regardless of ethnicity, but it is common to use Kazakh in both senses.